3rd generation autoflowering strain. First genetic evolution of SWS15 (Big Devil Auto®). A big sized feminized autoflowering strain. In response to the demand of our customers who asked for bigger autoflowering plants, we developed this genetic capable of reaching to a height of 1to 1,5 m.
3rd generation autoflowering strain. 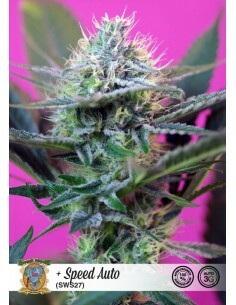 New autoflowering version of our SWS04 (Cream Caramel®). This is the result of the cross between our best 2nd generation autoflowering strains and Cream Caramel®. 3rd generation autoflowering variety. Sweet Seeds has created this hybrid as its tribute to this classic, well-loved family of cannabis. It is a hybrid cross between an Early Skunk elite clone and an automatic version of Critical Mass from Sweet Seeds´ R&D Department. 3rd generation autoflowering strain. Evolution of our SWS16 (Fast Bud Auto®). A very productive auto with big buds and plenty of aromatic resin. Extremely vigorous plants producing lots of very strong lateral branches. This is an autoflowering strain with an intense and exotic aroma, typical of the Diesel family. Very sweet and spicy, with fresh tones reminiscent of blue cypress aromas. Superior quality auto with dense buds and great resin production. Pungent sweet aroma with earthy tones. Fast flowering, strong effect and superb hybrid vigour. 3rd generation autoflowering strain. The evolution of SWS11 (Speed Devil Auto®). In this version of SWS25 (Speed Devil #2 Auto®) the average size of the plants has been increased and can reach to around 70-80 cm. We also find a bigger formation of crystals with a much more intense aroma. Sweet and musky with flavors reminiscent of yeast and cheese. This autoflowering variety has been developed by searching for the genetic traits responsible for very fast flowering, and is ready to harvest only 7 weeks after germination. It produces thick buds covered with aromatic resin. Sweet and fruity aromas with hints of yeast and cheese. This plant looks like an Indica, with a short internodal distance, numerous small branches in the main stem, compact buds and a big main cola. This strain is a great resin producer. SWS37’s (Black Cream Auto) aroma is very sweet and fruity, featuring a background of some earthy tones inherited from our Cream Caramel®. Resin production is abundant in the flowers and in their surrounding leaves. Sweet and fruity aroma with hints of incense and delightful citrus tones. After harvested and dried the buds gain a very dark purple tone, almost black.